The Rev. 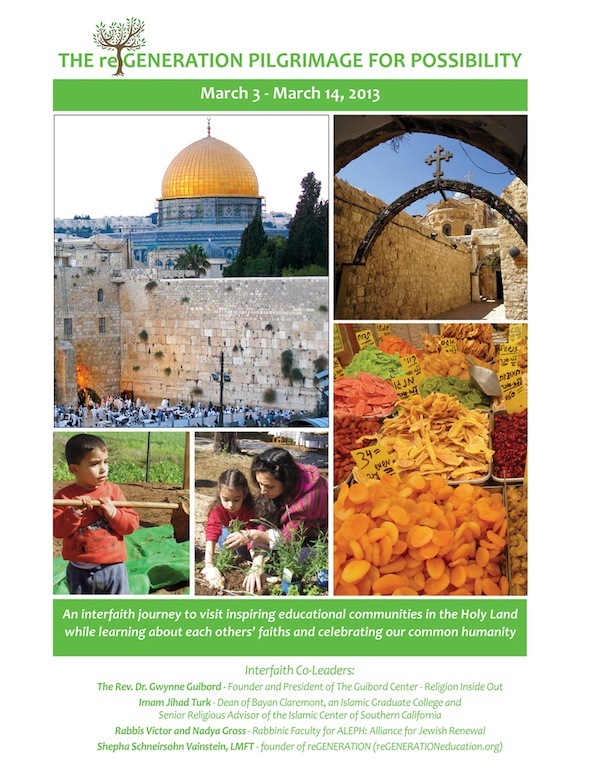 Canon Dr. Gwynne Guibord, Imam Jihad Turk, Rabbis Victor and Nadya Gross and Shepha Schneirsohn Vainstein, LMFT invite you to join us on this historic interfaith journey to the Holy Land. In addition to focusing on the sacred sites of Islam, Christianity and Judaism, we will visit visionary educational communities in Israel and the West Bank. We will celebrate Shabbat in Jerusalem, share a Eucharist Mass at the historic Synagogue Church, break bread at the home of a local Palestinian and picnic in an ancient olive grove. We will be inpisred by hope-filled visits to Israeli and Palestinian communities who are committed to educating children to cultivate a new generation in the Middle East who will have the means to work towards a better tomorrow. This pilgrimage will bring together people of different backgrounds and provide a unique opportunity to experience sacred space and sacred ritual through the lens of all three great montheistic faiths. 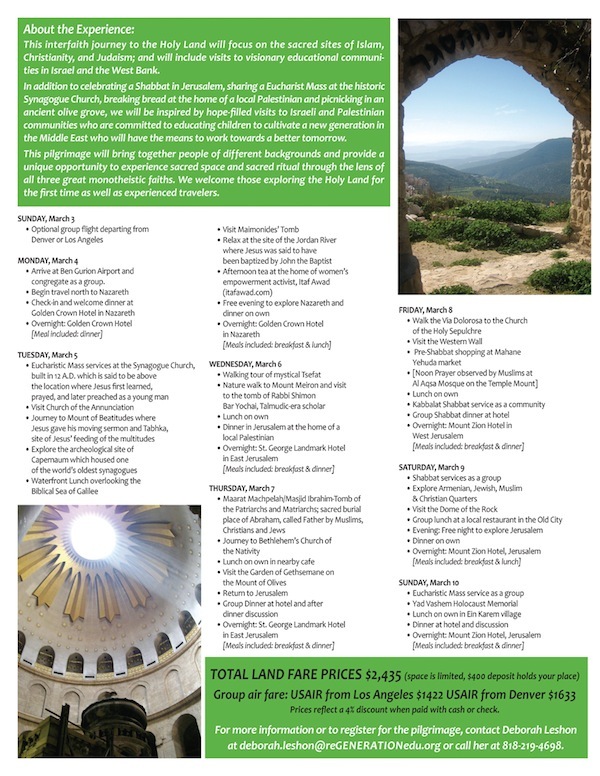 We welcome those exploring the Holy Land for the first time as well as experienced travelers. 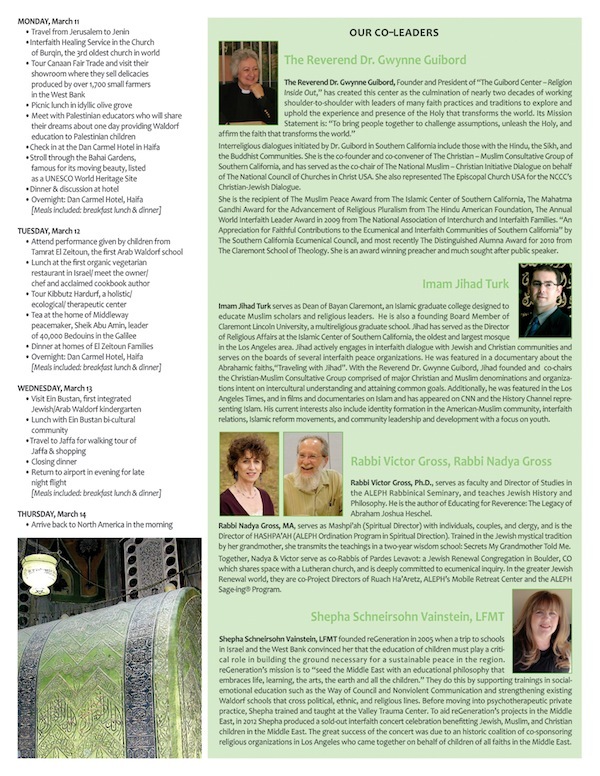 To download a pdf of the itinerary CLICK HERE. To download a pdf of the application and terms and conditions CLICK HERE.